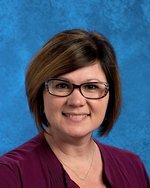 Mrs. Millard has a Bachelor's of Science Degree in Special Education from East Tennessee State University. Mrs. Millard has taught at Scenic Land School in Chattanooga for 3 years, Westview Elementary School for 1 year, Alternative Education Center in Walker County, Georgia, for 1 year, Rogersville City School for 2 years, and Cherokee High School for 9 years. Mrs. Millard has been married for 23 years to Jeff Millard, who is a teacher at Volunteer High School. They have two daughters. Photography is one of her passions.